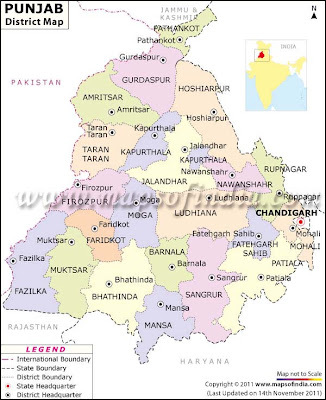 is a geographical region straddling the border between Pakistan and India which includes Punjab province in Pakistan and the states of the Punjab, Haryana, Himachal Pradesh, Chandigarh and some northern parts of the National Capital Territory of Delhi in India. The name of the region is Persian in origin and means "(The Land of) Five Waters" referring to the following rivers: the Jhelum, the Chenab, the Ravi, the Sutlej, and the Beas. All are tributaries of the Indus River, the Jhelum being the largest. Punjab has a long history and rich cultural heritage. The people of the Punjab are called Punjabis and their language is called Punjabi. 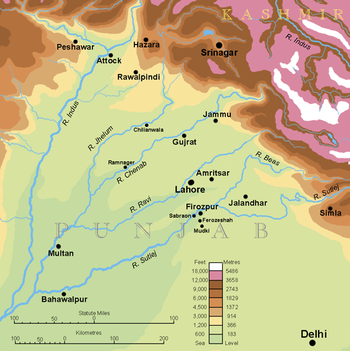 The main religions of the Punjab region are Islam, Sikhism and Hinduism. The area now known as the Greater Punjab comprises what were once vast territories of West Pakistan and northern western India. The Punjabi region of North India, Iran, Afghanistan and Pakistan, has a historical and cultural link to Indo-Iranian (Aryan) heritage identity. As a result of numerous invasions, many ethnic groups and religions make up the cultural heritage of Punjab. In 326 BCE, Alexander the Great invaded the Punjab from the north and incorporated it into his empire. The British Raj had political, cultural, philosophical and literary consequences in the Punjab, including the establishment of a new system of education. 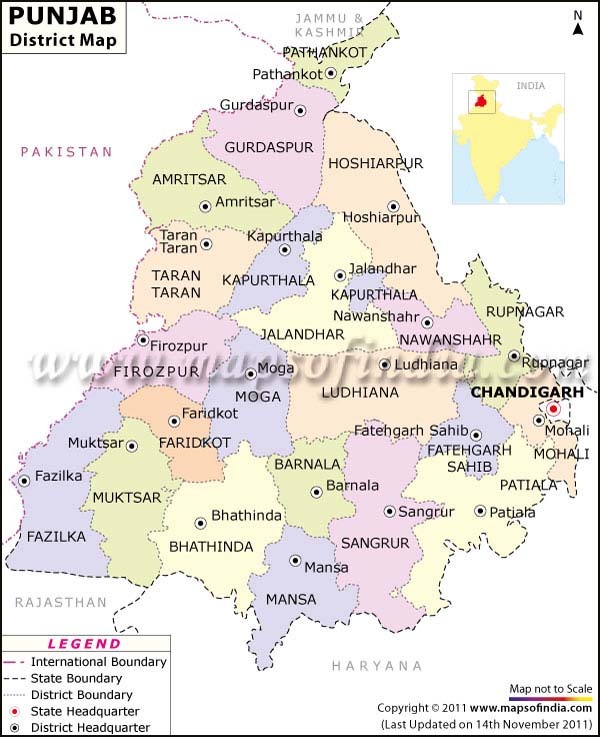 Punjab is situated in the North-Eastern part of India. The Punjab Climate is determined by the extreme hot and extreme cold conditions. The region lying near the foot hills of Himalayas receive heavy rainfall whereas the region lying at a distant from the hills, the rainfall is scanty and the temperature is high. Punjab Climate comprises of three seasons. They are the summer months that spans from mid April to the end of June. The rainy season in Punjab is from the months of early July to end of September. The winter season in Punjab is experienced during the months of early December to the end of February. The transitional Seasons in Punjab are the post monsoon season and the post winter season. Summer in Punjab actually commences from mid April. But the temperature starts rising from February onwards. The summer months are followed by the rainy seasons. Generally, the rainy season in Punjab begins in the first weeks of July. It ranges from 250mm to 1000mm. The agriculture of the state highly depends on the rains. The monsoon is brought by the monsoonal winds blowing over the Bay of Bengal. The winter season in Punjab is mostly experienced in the month of January, when the temperature falls to 5 degree in the night and it is around 12 degree in the morning. The post monsoonal transitional season remains quite fair and dry. In the post winter transitional season, hail storms and brief showers occur which causes damage to the crops. During the end of the March, the wind becomes dry. The Punjab Climate has been a great factor in contributing to the economy of the state.
. Peaks of Punjab Himalaya . is an Indo-Aryan language spoken by inhabitants of the historical Punjab region (north western India and in north eastern Pakistan). For Sikhs, the Punjabi language stands as the official language in which all ceremonies take place. In Pakistan, Punjabi is the most widely spoken language. Punjabi can be subdivided into two varieties, known as Eastern Punjabi and Western Punjabi. The Punjabi language has many different dialects, spoken in the different sub-regions of greater Punjab. Modern Punjabi is not the predominant language of the Sikh scriptures (which though in Gurmukhi script are written in several languages). Punjabi is spoken as a native language by over 2.85% of Indians. Punjabi is the official language of the Indian state of Punjab. is the most common script used for writing the Punjabi language. "guramukhī", meaning "from the mouth of the Guru". The 10 Sikh Gurus adopted the Proto-Gurmukhi script to write the Guru Granth Sahib, the religious scriptures of the Sikhs. from the gramophone . . . Sat Siri Akal (Truth is God) - Namaste ! rose moon . . .
A Sikh place of worship is called Gurdwara. The Golden Temple, in Amritsar is the most sacred place of the Sikh religion.
. WKD : Barah Maha . is a form of folk poetry in which the emotions and yearnings of the human heart are expressed in terms of the changing moods of Nature over the twelve months of the year. In this form of poetry, the mood of Nature in each particular month (of the Indian calendar) depicts the inner agony of the human heart which in most cases happens to be a woman separated from her spouse or lover. In other words, the separated woman finds her own agony reflected in the different faces of Nature. The tradition of Barah Maha poetry is traceable to classical epochs. In Sanskrit, the Barah Maha had the form of shad ritu varnan, i.e. description of the six seasons (shad = six; ritu = season; varnan = description), the most wellknown example being Kalidasa's Ritu Sanhar. The mode was commonly employed to depict the moods of the love stricken woman in separation, and it became an established vogue in medieval Indian poetry. Modern languages of northern India claim several distinguished models. In Hindi, the first instance of this poetic form occurs in Malik Muhammad Jayasi's Padmavat. In Punjabi, Guru Nanak's Barah Maha in the measure Tukhari is not only the oldest composition belonging to this genre but also the first in which the theme of love poetry has been transformed into that of spiritual import. He made the human soul the protagonist which suffers in the cesspool of transmigration as a result of its separation from the Supreme Soul. This is followed by Guru Arjan's Barah Maha. Later some Sufi poets such as 'Ali Haider, Bulleh Shah, Hasham and Shah Murad also wrote barah mahas. Haflz Barkhurdar was the first poet in the Punjabi romantic tradition to compose a barah maha as an independent work. In the eighteenth and nineteenth centuries, there were a number of barah mahas and siharffs written in Punjabi. Poetry in this class can be broadly divided into various types religious, farmers' narrative (included in an epic poem), viraha (separation) and 'trial of chastity* variety. Guru Arjan's Barah Maha falls in the viraha category, depicting through the twelve months the pangs of the bride, i.e. the human soul separated from her Divine Essence. In Punjab, haiku was introduced by Parminder Sodhi who lives in Japan around 2001. Greatly influenced by Sodhi’s book “Japani Haiku Shairi”, Amarjit Sathi started writing and promoting Punjabi haiku in 2003. In 2008 he published his first Haiku book under the title “Nimakh”, which means the time it takes to blink an eye. Sathi has an immense love for the genre and see it as a possible form of poetic expression in Punjabi. Amarjit Tiwana learned of the haiku form in Punjabi through Parminder Sodhi who, living in Japan, made a book of translations entitled Japani Haiku Shairi. He was introduced to this book by his mentor Angelee Deodhar in 2003. Since then Amarjit has taken the promotion of haiku as his life work.
. Haiku from Punjab . Gabi, Thank you for including us in such a great collection of blog posts. We greatly appreciate it! In Punjab, haiku was introduced by Parminder Sodhi who lives in Japan around 2001. Greatly influenced by Sodhi’s book “Japani Haiku Shairi”, Amarjit Sathi started writing and promoting Punjabi haiku in 2003. In 2008 he published his first Haiku book under the title “Nimakh”, which means the time it takes to blink an eye. Sathi has an immense love for the genre and see it as a possible form of poetic expression in Punjabi. thanks Gabi, please be a member of Punjabi Haiku Group,so it will help to understand haiku together..Admin Punjabi Haiku.